My young niece, Jackie, wears a diamond Star of David around her neck, a birthday present from her grandmother. Although I might otherwise be uncomfortable with a six-year-old wearing diamonds, Jackie’s necklace deeply moves me and other members of our family. This is because it came not from her Grandma Helen, my exuberantly Jewish stepmother, but rather from Rose, her devout, Italian Catholic grandmother. Rose’s gift to Jackie was a gift to our entire family–and, from my perspective, to other Jews as well. Helen tells me of her amazement: “I don’t think I could do it. I could never buy one of my grandchildren a cross.” Her words prompt me to think of what I would do if I found myself in a similar situation: How would I react if I had a Christian grandchild? The answer, I’ll admit, is not well. Helen couldn’t buy one of her grandchildren a cross. I couldn’t do it either. 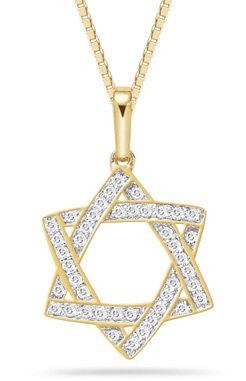 Thinking about Rose, a recent widow in her 80s, walking into a jewelry store and asking to see Stars of David awes me. Her gift has brought home to me in a very profound way what it means for “the other side of the family” when children are Jews in an interfaith home. I remember attending a Bar Mitzvah service of the third and youngest son of an interfaith couple. The older two boys had become bar mitzvahs, but at another synagogue. Hence, the rabbi who worked with Danny, the third b’nai mitzah, was new to the family. During the service, she turned to Danny’s Christian mom and her extended family, and thanked them. She thanked them for their gift. She thanked them for so generously and supportively giving Danny to the Jewish people. I admire Audrey and hope that I could react and act as she does. It would be a tall order, but as Audrey says, there is no other choice. This, to me, seems very different than Grandma Rose’s situation with Jackie. Yes, she had to attend Jackie’s naming ceremony and family Hanukkah and Passover celebrations. These are “going along” kinds of things–very different than actively seeking and buying and giving a Star of David. At six, Jackie is too young to have an understanding of the meaning of her grandmother’s gift. She knows the necklace is “special” because people are making a small fuss about it. I suspect that she thinks the fuss is because it cost a lot and is so beautiful. This is true, in a sense, but it will take many years for Jackie to fully comprehend the extraordinary meaning of her grandmother’s gift. I hope that this courageous and generous woman will be alive and well seven years from now when Jackie becomes a Bat Mitvzah. I like to think that Jackie will still proudly wear her Star of David necklace and that she will have begun to appreciate what a remarkable gift it was. Ellen S. Glazer is a clinical social worker in private practice in Newton, Mass. Her work focuses on infertility, adoption, pregnancy loss and parenting after infertility. She is the author or co-author of six books, the most recent being Having Your Baby Through Egg Donation.